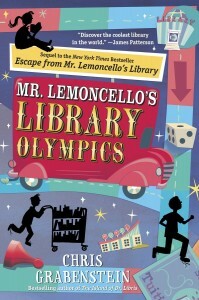 While I enjoyed the first children’s book in this series, Escape from Mr. Lemoncello’s Library, I think this second book surpasses that one. In fact, there is enough repetition in the sequel that you can easily read this book first. The reason I found this particular children’s book compelling is that it offers a very strong message about the importance of books, libraries, and freedom of press. There are a few moments where an irate mother is interested in burning some books, and the response is one of horror from the children. Lest you think sending a message about keep books free is unimportant, the author includes a list of banned children’s books at the end of this children’s book. It may make your hair stand on end! Back to this book, I found the puzzles in the book quite easy this time, whereas I found myself struggling in the last book to make sense of them. The genre of including literary clues in a book is fun, as it adds another element in addition to reading for plot and action.